A recipe in a ..erm, recipe book appeals to the senses even more when we see it actually being prepared on TV or in a video. This yummy and 'hot' Pulao with the spiciness of Pepper and Red Chili is from one among the thousands from the Sanjeev Kapoor repository !! It was so inspiring we just had to try it that very weekend. 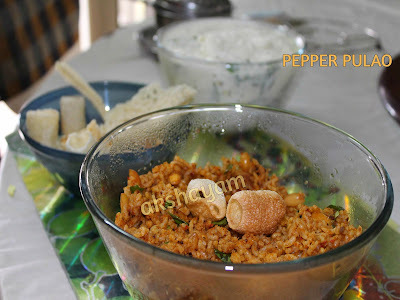 Served with crisps and raita, it was simply AWESOME !!! 1. Heat a pan and dry roast the red chili, pepper and jeera. Cool and grind to a coarse powder. 2. Heat ghee in a larger pan, add chana dal, urad dal, rai and peanuts. Saute lightly. 3. Add the chopped onion, curry leaves and fry till the onion sweats a bit or becomes golden brown. 4. Add salt to taste and cooked rice and mix well. Remove from the fire. Finally add the ground spices, a little at a time, and mix the rice gently. Transfer to a serving bowl and serve hot as desired.